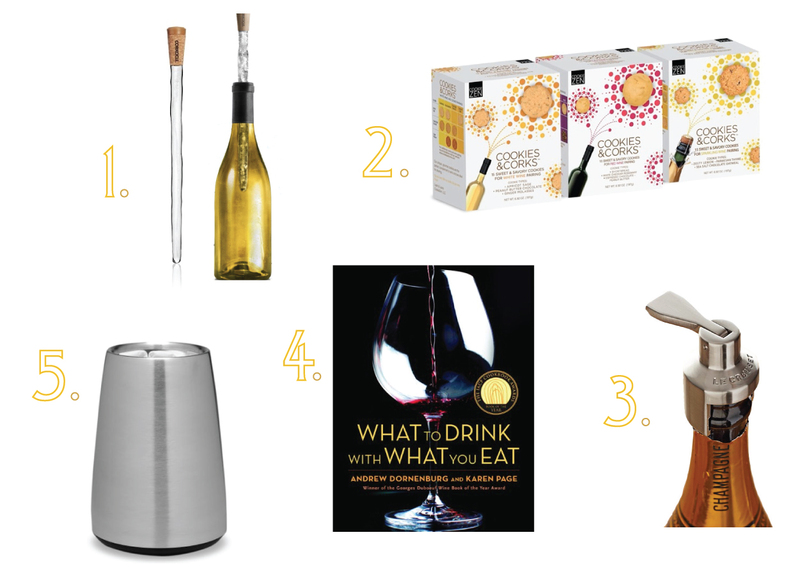 christmas gift guide: wine lovers | Is there any wine left? the leader said we should aim to drink nothing but water every day. but a world without wine is not one in which I want to live. 1. Wine Lines ID Tags – these cheeky tags are a fun way to distinguish glasses from one another. 2. Spanish Wine Glasses – simple wine glasses: stackable, easy to store, great for parties. 3. BuiltNY Wine Totes – these neoprene sleeves are a fun way to present a bottle of wine. 4. Electric Corkscrew – open wine bottles easily with the simple push of a button. 5. How to Love Wine by Eric Asimov – a down-to-earth discussion of loving wine written by New York Times chief wine critic. 1. 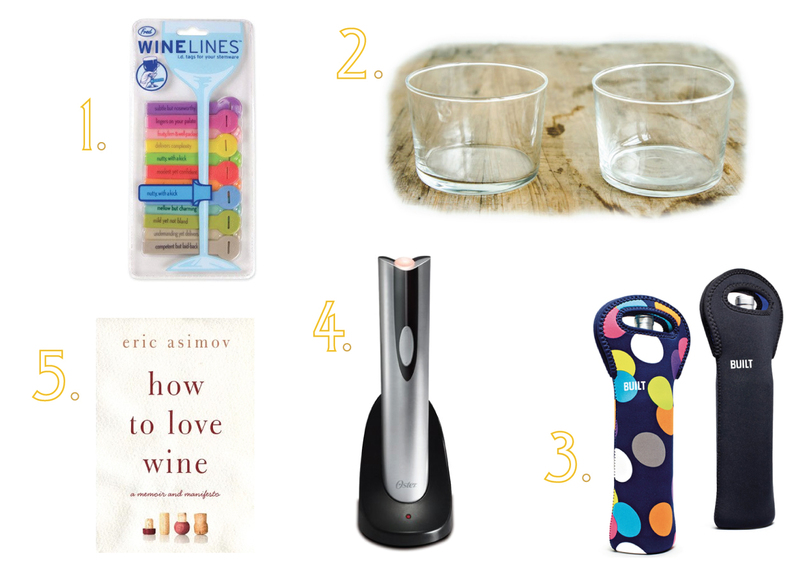 Corkcicle – maintains the temperature of chilled white wine for 45 minutes to 1 hour. 2. Cookies & Corks – sweet and savory cookies perfect for wine pairing. 3. Le Creuset Champagne Stopper – we all know how impossible it is to get champagne corks back in the bottle. This nifty little tool saves you the hassle. 4. 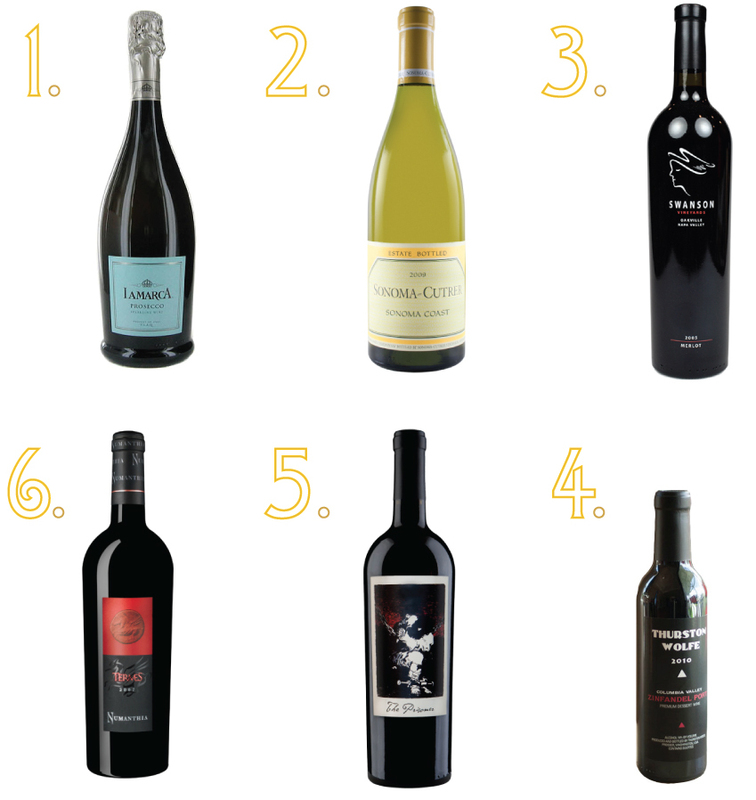 What to Drink with What You Eat by Karen Page and Andrew Dornenburg – while focusing primarily on wine, the authors include matches for a variety of other beverages, including tea, water, coffee, beer and spirits, and offer the pairings in reverse. 5. Rapid Ice Wine Chiller – can chill a bottle within five minutes and keep it cool for up to four hours. 1. 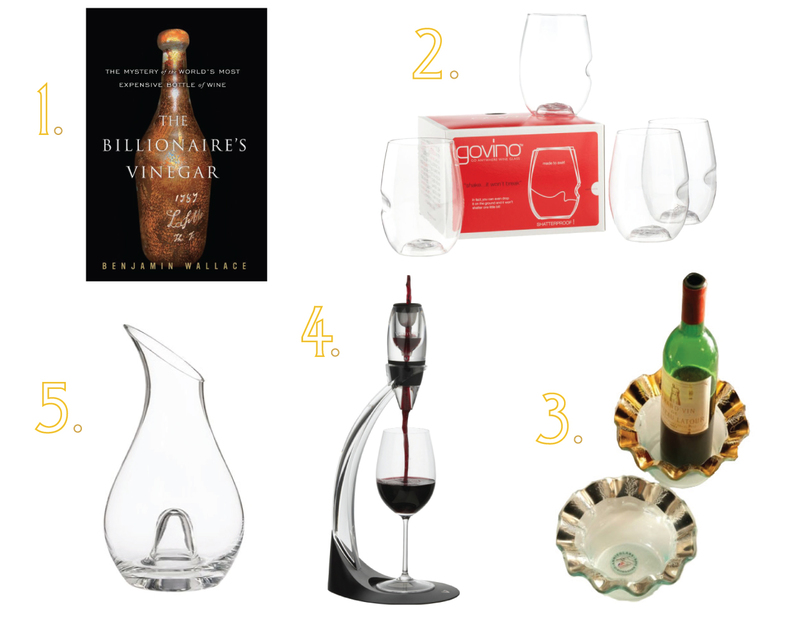 The Billionaire’s Vinegar by Benjamin Wallace – Part detective story, part wine history, this is one juicy tale. 2. Govino Wine Glasses – these unbreakable glasses are made from a food-safe, 100% BPA-free polymer, which reflects a wine’s color and projects its aromatics much like crystal. 3. Annieglass Ruffle Wine Coaster – an elegant coaster for entertaining (bonus: it’s dishwasher safe). 4. Vinturi Wine Aerator – easily and conveniently enhances the flavor, bouquet, and finish of any wine by speeding up the breathing process and instantly aerating in the time it takes to pour a glass of wine. 5. Thumb Decanter – makes pouring a glass of wine a cinch. 1. La Marca Prosecco – a well-balanced Prosecco at a great price point; hints of apples and grapefruit, with a light creamy mineral texture on the palate. 2. Sonoma-Cutrer Sonoma Coast Chardonnay – my favorite white wine, with hints of Meyer lemons and nectarines and a creamy finish. 3. Swanson Merlot – full-bodied and dry, with black cherry and plum flavors. 4. Thurston Wolfe Touriga Nacional Port – a strikingly dense wine, with black cherry, cassis, chocolate and coffee liqueur flavors. 5. The Prisoner Red Blend – my favorite red wine, an intense blend of Zinfandel, Cabernet Sauvignon, Syrah, Petite Sirah, Charbono and Grenache. 6. Numanthia Termes – elegant with velvety texture, ripe tannins, and silky finish. I am obsessed with The Prisoner! In fact, I just added it to my Christmas list (yes, I still have a Christmas list)! I was looking at The Prisoner at Spec’s yesterday and one of the Spec’s people recommended the Tudal Family Winery 2010 Red Wine as an alternative; it’s half the price and, per the lady at Spec’s, almost identical in taste. Naturally, I bought a bottle, so I’ll let you know how it compares.